Yesterday, we hiked through the woods to our neighbor's Christmas tree farm. It was the first day that we've had any significant snowfall this season. This time last year, we had a couple of feet of snow. After deciding on a tree, the kids carried it back home. I wore the baby in the cloth sling and had her bundled up toasty in lots of mismatching woolens since she had the flu. We put on the lights and, last night, the ornaments. Now the living room has a nice soft glow to it that I just love. I could keep a Christmas tree up all year, just to see the pretty lights. ...while the boys had the more difficult job of carrying the tree home for us through the woods. Yesterday, our family had a celebration for Our Lady of Guadalupe. We have had a party for her almost every every year since Ben was a toddler. Usually we have enchiladas, spanish rice and punch, sometimes carry out tacos if time is short or there is a new baby. Often we play pin the tail on the donkey, do the mexican hat dance. One year we had a pinata. This year, we used the lovely ideas by Alice Gunther who so generously shares her creative Liturgical Teas at her blog Cottage Blessings. Last winter some ladies from our homeschooling group got together and used Alice's plans in a group setting. I vowed this year I would do them at home with my entire family. My mother came over and helped prepare the food. I wish I had photos of the food to share with you but I was so caught up in the festivities that I did not take any. Every thing on the menu was delicious, lovely and meaningful. I placed a small potted rose plant next to Our Lady's picture on the table alongside our perpetual candle lit in her honor. The children behaved well and were attentive, the food was done on time and everyone had a wonderful evening. That doesn't all happen very often, where everything just seems to fall into place. In fact, earlier in the day everyone was upset and grumpy. It did not seem that our party was going to get off the ground. Children were irritable and our family was sad. Our dear friend has had some setbacks in his health, on the eve of the day we had hoped for a miracle. He had to postpone his trip to Mexico City. So we continue to pray on his behalf and are grateful to those of you who are praying along with us. When the table was spread and the story of Our Lady was being read, everyone forgot their grumpiness and became quite grateful. Grateful for a home in which to live, for a plot of land on which to romp, for a family who loves them, for the friendship of those who truly care about our family. 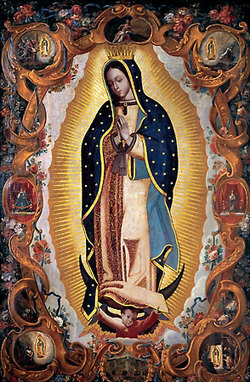 All of these things we recognize as having come from God, through the intercession of Our Lady of Guadalupe, the patron saint of our family. Here are some photos of some of the decorations we put up last weekend. This is our family room which now contains the tree that we cut last weekend. That is a stack of undelivered boy scout popcorn in the corner. :) We are hauling it out today to be delivered. 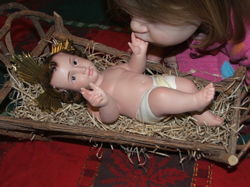 Here is a closeup of our manger scene which is under the berry wreath on the far wall. I love the simplicity of the Willow Tree figures, clean lines, muted colors. 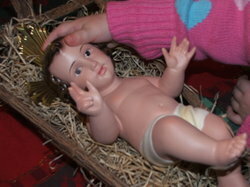 When I first got the set, I was disappointed that I could not wait until Christmas Day to put the baby Jesus in the scene because He is attached to His mother. However, now the Blessed Mother and Child figures are my favorite in the manger scene and the love between them is captured in a very sweet manner. I also have the three wise men and their camels which do not come out for some time, working their way across the room by Epiphany. The vintage ceramic tree was Mike's grandmother's. My grandma had one as well, as did my aunt, though hers was white. Susan posted a photo of hers a while back and I loved reading all of the comments and memories people had of their grandmother's trees. I think it looks so pretty when the lights are low. I picked up a tall, thin artificial tree a couple of years ago at Target. We are using it this year as a second tree to hold the children's ornaments. They have received quite a few since they were born and they enjoyed having a tree of their own to decorate. While I don't save each ornament they make over the years, I do save those that are sturdy or that are special to them. 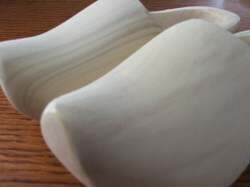 Some are made of wood or clay or beeswax. I hope someday they will hang them on their trees and enjoy them. 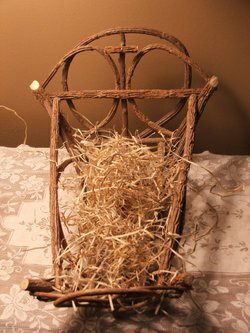 The little manger is filling with hay. Lastly, here are some photos of our gingerbread house that we made Tuesday with Mike's mom. She came for the day and the kids had such fun. The kids have been itching to eat it but I think we will save it for our Our Lady of Guadalupe celebration tomorrow. Advent is, by far, my favorite time of the year but it can be such a busy time of preparation that it is easy to become discouraged if our focus shifts from the coming of the Christ Child to the hustle and bustle of our culture. Keeping Advent peaceful and meaningful can be done in a variety of ways. Our family spends time each evening sharing simple devotions. That can be as easy as lighting a small candle next to a picture of the Infant Jesus or by praying the Rosary as a family. Our family's traditions of the lighting the candles on the Advent log and filling the Christ child's manger are things we have done since my oldest was a toddler. They are lovely traditions that work for our family. They may not work for yours as every family is different and unique. 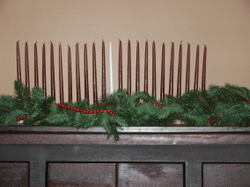 I think it is not important or prudent to adopt a bunch of different advent devotions, crafts or projects each year. There are many out there to choose from and can be overwhelming. Choosing or creating one or two traditions and doing them year after year is more important than getting swept up in the myriad of possible ideas. We want our children to remember simple, lovely, meaningful times of preparing our hearts for His coming. If you have stumbled upon my humble site looking for Advent ideas, I have linked our family's traditions below. They look like many but really are only the two mentioned above. I am linking those posts below because I have noticed many visitors coming here in search of Advent devotions or information in constructing the Advent log. If you and your family need more information about the log, you can email me at the address in the sidebar and I will do my best to help you. Our family's entire advent archives can be found here. Blessings and peace to you and yours this Advent season! Annie has a very strong devotion to the Infant Jesus. She seeks out statues of Him at church, asking to stop there when we are out by pointing and saying "Jesus!". She has an Infant of Prague statue on her bookshelf and a picture of Him in frame in her room. 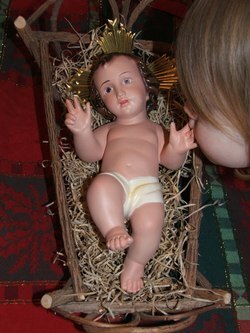 She was thrilled that he had arrived on Christmas Day, filling the manger with His sweetness. and she has been patting His little head. Annie has been saying single words for many months, "Mommy", "Daddy", "ball", "birdie" and most recently her name. Yesterday, for the first time, she strung two words together and said, "Baby Jesus". She just makes my heart melt. ..is growing softer day by day. 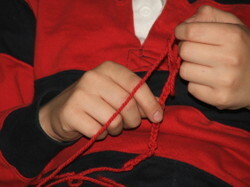 Last summer, during my investigation into Waldorf homeschooling, I was intrigued by the concept of finger knitting for young children. While I don't ascribe to Rudolph Steiner's philosophy or the esoteric reasons for introducing fingerknitting, the handcraft itself sounded like a whole lot of fun in its own right. In hopes of teaching Mary to fingerknit while the rest of us used needles, I bought the book Finger Knitting by Katsuno Suzuki. I expected to find directions for teaching children to make some simple projects. There are a couple simple projects but most of those in Suzuki's book are downright complicated even for an adult! Today we began to make some garland for the tree. 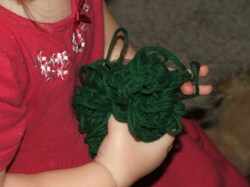 I brought out the red and green yarn and the kids had much fun making chains. I was inspired to do so from these posts over at Soule Mama. Even Annie got in on the act, trying to finger knit with her chubby little hands. When we finish the garlands, I will post some photos for you to see. 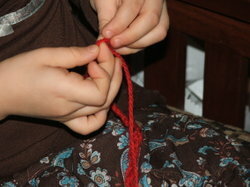 Update: How to Finger Knit video clip here. We spent yesterday baking Christmas cookies. Above are Margaret's Soft Sugar Cookies, Chewy Ginger Snaps and Mom B. 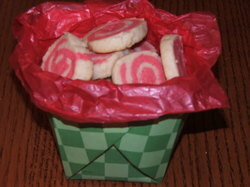 's Peppermint Pinwheels. 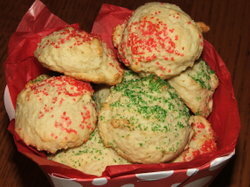 I make a half dozen different kinds each year and usually package them in little gift bag or tins. 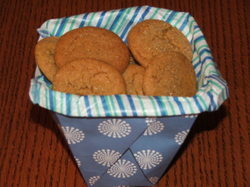 This year we tried our hand at Violet's origami paper boxes to use as cookie containers. We lined ours with tissue to make a pretty, handmade way to package treats for the neighbors. 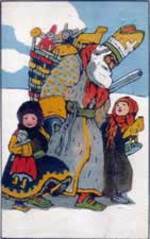 There are many beautiful traditions associated with St. Nicholas Day. Many of them center around the filling of stockings or shoes. Our family sets out wooden shoes by the fireplace on the Eve of St. Nicholas in hopes that he will fill them with treats, perhaps some gold chocolate coins, a clementine and other goodies. The wooden shoes were given to us by Mike's mom, who has purchased them for each of our family members from the Wooden Shoe Factory in Holland, Michigan. Mike brought his boyhood pair with him when we were married and his parents bought me a pair soon after. With the birth of each grandchild, Mike's mom drives to Holland for a "field trip" to pick out a pair of shoes. This year, a new little baby girl was born in Mike's brother's family so she made the long drive again. Ben was thrilled to be invited along and spent a wonderful time with his Grandma at the factory and outlying shops in the village. 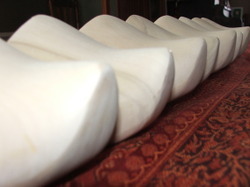 Our wooden shoes are lying in wait for that bearded saint to fill them with scrumptious delights! For more information on St. Nicholas books, cookie cutters and artwork, visit the St. Nicholas Center. In keeping with our theme of handmade gifts, Mary and I made this little fellow today. He is a present for Annie who is quite fond of monkeys. He was made using two cotton Rockford Red Heel Socks. 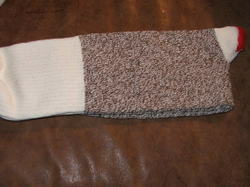 Rockford Socks originated in Rockford, Illinois and have been made in the USA since 1880. They are now owned by Fox River Mills in Osage, Iowa. 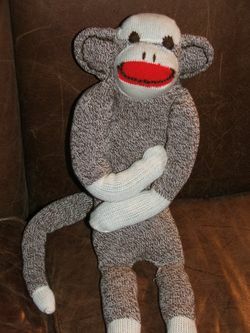 Each pack (2 pair) of Rockford Red Heel Socks comes with directions for making the sock monkey and an elephant as well. Last month, I had the pleasure of meeting Molly and her sweet family at a Jan Brett book signing. As well as getting to spend time chatting with her, she also brought me an generous bag of clean, carded wool! I am still giddy over her gift and have been using it to stuff toys like this little guy, as well as the knitted farmyard that I have been making for Mary (more on that in another post). So, I did the sewing and Mary stuffed him with Molly's wool. It was fun to work on him together and watch her excitement grow as he drew near completion. We will try our hand at some more animals in the upcoming weeks. Sherri writes: "A handmade Christmas sounds good to me and to my little ones but what about the big kids who don't want a hand knitted sweater or a homemade wooden train?" That is a great question and one that I have been chewing on for the past few weeks. My oldest is eleven, still very much a child but not as interested in toys or clothes these days. I didn't know what I could make for him to open on Christmas Day. I decided that this year, I would give him a Gift of Time. Here's how it works: Rather than something store bought, I will wrap up movie, concert, or musical tickets, a travel brochure or some other invitation to a place he'd enjoy and make a date of it. I know my children PINE for time alone with Mom or Dad. When Christopher was a preschooler, he was interested in trains. My mother wrapped up two train tickets and a conductor's hat for Christmas. Two weeks later, they spent the afternoon riding the rails together. He had a grand time and still remembers it today. Had she spent that money on a toy, DVD or video game, it would have been long forgotten. The memories surrounding her Gift of Time are longer lasting and more meaningful. We know of a couple who no longer buy their kids presents now that they are teenagers but take a weekend ski trip together as a family every winter instead. They have been doing this for the past few years and their children look forward to spending time together in lieu of gifts. 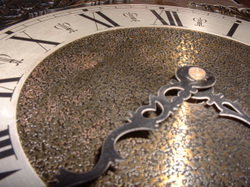 A Gift of Time can be as expensive or inexpensive as you'd like. Think about what makes each of your children happy. Each and every child is different. Would yours enjoy an afternoon matinee and lunch with Mom? How about a hockey game, dinner and sledding with Dad? Take some time to make the idea come alive on paper by adding a letter in the box or gift bag along with your tickets, menu or other item. This year for Christmas you and I are going on a get away together for an entire afternoon, just the two of us! First, I'd like to take you out to lunch at Bo Loong for Dim Sum. I know how you LOVE their pineapple buns! Then, let's take a trip over to the science museum and catch the newest Imax movie. Afterwards, if you're not too tired :), let's head to the square for some ice skating . I am looking so forward to spending the entire afternoon with you! If you have babies or toddlers who need to be with mom, perhaps they can come along in a sling or you can get out for a bit while they are napping. Or, stay home and make your own fun once they have gone to sleep for the night! One of my children's favorite things to do is to be able to stay up "way late", after all their siblings are in bed. We make popcorn, perhaps watch a movie or put on a fire and play board games, just the two of us. Then we camp out on the floor in sleeping bags. You don't have to spend a lot of money to share time together or make memories. Big kids need our time more than they need more things. Spending time together, just parent and child, will make lifelong memories and will strengthen our relationships with our children. I mentioned that we have plans to make most of our Christmas gifts this year. 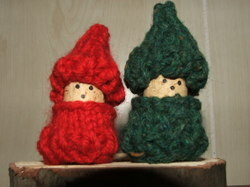 I love the idea of making gifts and buying handcrafted items that other people are selling. I am so fond of Etsy. Have you spent any time there? It is a handmade haven. But guess what? I bought the sweetest hand crocheted poncho, hat and shoes for Felicity at Etsy for $7 for ALL THREE. 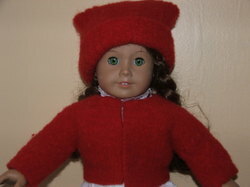 Just type "American Girl Doll Clothes" in their search engine and you'll be surprised what you'll find. I've installed this button in my sidebar. Advent is Just Around the Corner! My children are thrilled that our favorite time of the year is fast approaching! While it can be a time focused on getting gifts ready for Christmas, it is also such a beautiful, thoughtful time of preparing our hearts for the coming of the Christ Child. This year, I have resolved not to get swept up in the busyness, the hustle and bustle of it all but to focus on keeping it a peaceful time of preparation. Kristen, at Small Treasures wrote a beautiful post reminding us to simplify the season. Years ago, I used to fly from store to store in search of the best gift for each person on my list. The past two seasons I have done most of my shopping online. However, this year, our Christmas will be almost entirely homemade. I think eliminating the shopping and spending time together doing handcrafts in the afternoons will remove much of the stress from the season. Last season, I shared quite a bit about our family's Advent devotions and traditions. I am linking them all below for anyone who might be interested in reading them. I do have the remaining Advent devotions as well as those for the Twelve Days of Christmas. If you would like them, do drop me a line and I will pass them along. Also, be sure to stop by Mary Ellen's special site O Night Divine, the perfect place to find Advent and Christmas inspiration, crafts, recipes and more. Last year, she had several guest authors who offered great ideas to make the season more meaningful.